Text and images contained within this pattern are not authorized to be placed in full or in part on any website, book, magazine, page or forum. Finished products can be sold. Body, Limbs, Head: multi colored worsted weight yarn medium #4 Red Heart and Bernat Soft Boulce Bulky #5 held together. 10mm black safety eyes placed over white felt. 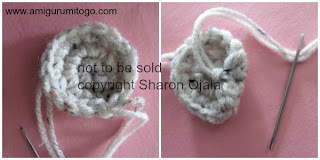 Special notes: I worked in continuous rounds with a 5.00mm hook. I held 2 strands of yarn together for every part except for the red bands, those are all 1 strand. I use the jogless stripe method when switching colors which uses a sl st for the first st of the new row with the color change. The sl st is counted as 1st. Each row has a sequence as given below. For example 1sc then 2sc in next st means repeat that sequence 1sc then 2sc in next st followed by 1sc then 2sc in next st over and over to the end of that particular row.The lighter colors are 2 strands of worsted weight yarn held together. 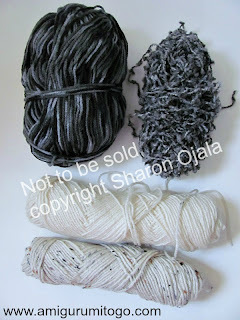 The darker colors are a strand of worsted weight yarn and a strand of boucle yarn held together. 13) Last thoughts and tips! *if you choose safety eyes then remember to put those in before stuffing and closing the head. Since mine is not going to a small child I glued the safety eyes on after the head was sewed to the body and I put on the muzzle. I played around with the placement until I was happy with the look. If you like where I put Darcy's then put them in between the 15th and 16th row and about 12 to 14 stitches apart. f/o and cut free leaving a long tail of the worsted weight yarn for sewing and cut the boucle yarn shorter, hide the boulce yarn tail inside head. sl st and f/o and cut free leaving a long tail for sewing. You can cut one shorter than the other and just hide it or use both for sewing. Whatever works best for you. Add in a mouth and nostrils before stuffing and sewing to face. If you want bigger ears just add a 4th row. 1sc in next 2st then 2sc in next st. Then f/o. *start stuffing body. Make sure to add in extra for that belly! 39) ch1 pinch top of leg together then 1sc right through both sides 7 times across the top edge. f/o and cut free leaving a long tail of the worsted weight yarn for sewing and cut the boucle yarn shorter, hide the boulce yarn tail inside leg. 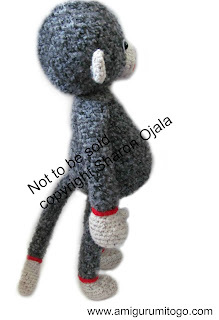 I sewed the open end right to the body of the monkey. I set the legs back a ways from the belly to make it look like the belly is even fatter. If you chose to make folding legs then sew the flat end to the underside of the body. f/o and cut free leaving a long tail of the worsted weight yarn for sewing and cut the boulce yarn shorter, hide the boulce yarn tail inside arm. Flatten the top of the arm and sew to top of body, just under the head. Hide yarn tails inside body when done. using the lighter colors you can either pick up stitches or make the thumb and sew it in place. I've included instructions for both. And that's it! If you made Darcy please post pictures on my facebook page Amigurumi Freely I would love to see! 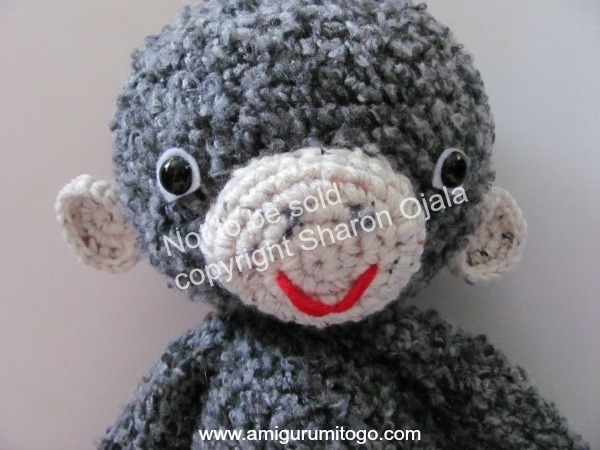 Hi Sharon really love this monkey ...I've made a few so far. A variety of different colors. What a cute monkey! And thanks for making the pattern free! thanks so much! And you're welcome, the world needs more monkeys! Hey Sharon~ Thanks I am going to get the yarn for this tomorrow. It's very nice. Thanks for the pattern. Es muy bonito. Gracias por el patrón. A great pattern, he is a Featured Friday Find at www.atplayonline.com! How adorable, I have a couple of grand daughter that would love this! I have 2 nephews under the age of 3. I see Christmas presents! Thank you so much for sharing this!!!! Very cute!! Thanks for posting the pattern! This is the cutest thing ever! I can't wait to make it for my best friends new baby. Thanks so much for sharing! I don't know how I just discovered your blog but I wanted to take a second and tell you I have plans already to crochet Hobbes for my 42 year old son! He is a big Calvin and Hobbes fan! BTW, any plans to do Calvin? And this great monkey will be getting lots of cuddles from my great-nephew! thank you for all you do for us crocheters!! Hi Brenda, great to see you! I'm so glad you are enjoying the patterns, however Hobbes isn't my pattern, I think you must of seen it on my facebook page, Amigurumi Freely. I post patterns there everyday from all sorts of designers. I also post my own patterns but in the description I always state who the pattern belongs to and then give the link to the pattern. All my own patterns will always be linked back here to my web site, www.amigurumitogo.com. I normally have my web site address written at the bottom of all my pattern pictures as well. 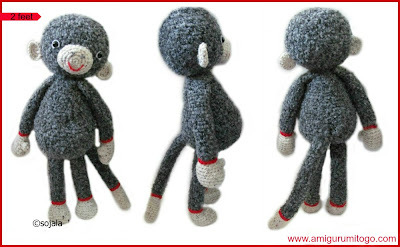 I'm very happy to hear you will be making this monkey, he is a great one for cuddles. My kids love him too! This is so cute. I'm going to make it for my niece for Christmas. I love all the options you provided. Thanks. I love this pattern, he is super cute. I'm almost finished making one for my 3yr old daughter. 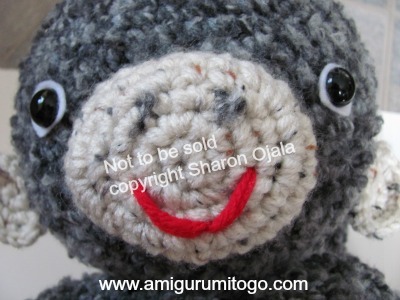 I'm using a fuzzy yarn so it is super furry :) thankyou very much! I am only using one strand of yarn and the head of the monkey was huge. What did I do wrong? Any suggestions that you have will be wonderful. what weight of yarn and what size hook did you use? Thank you so very much for sharing these beautiful patterns. Truly appreciated. Will make great gifts for Christmas! Hey Sharon~ What is a good substitute for the boucle? It is not the same anymore. Hey Sharon! I made one of your adorable monkeys about a year or so ago (loved it! ), and now I'm going to start a second one for a dear friend who is expecting. Anyways, I can't for the life of me remember how much yarn I went through the first time around. 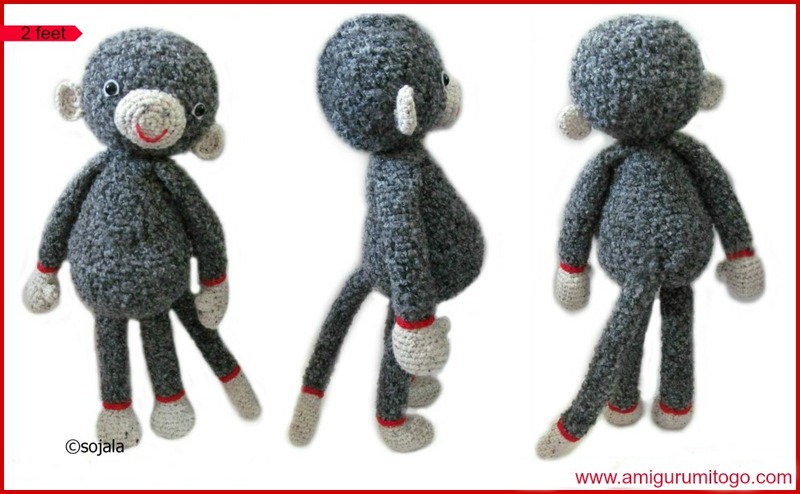 Can you please give me an idea as to how much yardage I'd need to make the "single strand" monkey? I'd really appreciate it! I use the jumbo rolls (Red Heart Comfort) so it's hard to say exactly. But a lady told me on fb she used one package of Red Heart Super Saver.. you can google that for package details. Hope that helps. I do plan to revise this pattern this year and put in there the yarn needed, I really have no idea what I was thinking at that time by not putting it in there, lol so sorry! 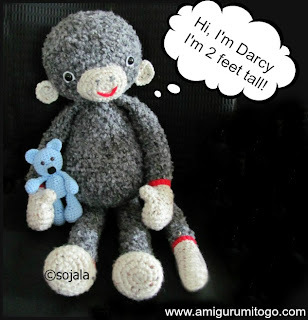 A million thank you's for the Darcy pattern. 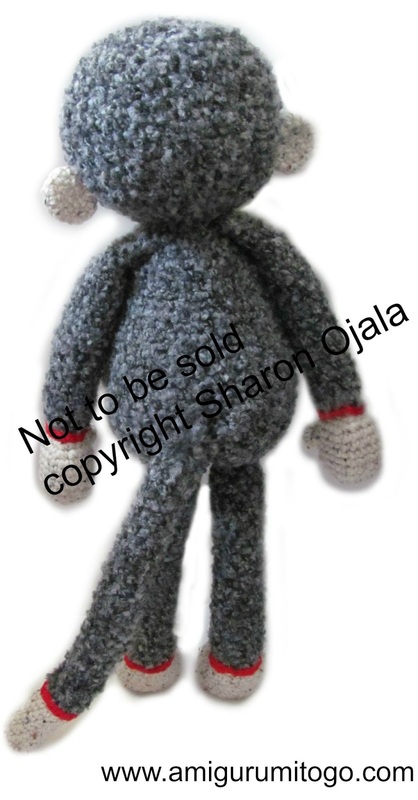 I made him for my mother who is in a nursing home, nearly 100% blind, going deaf. She grew up with monkeys in her native Nicaragua and I know it will comfort her to hold and hug him. I am hundreds of miles away and it was wonderful to give her this labor of love! Hi Sharon! I'm working on my big monkey as we speak! I had a question for you, that I realize maybe I should have asked before I got started. I noticed some of your other amigurumi, you crochet the head and body together all as one piece--whereas Darcy is in two pieces, head and body, and then sewn together. May I ask why you chose to make him this way? Furthermore, is there a way to crochet him so he's all one piece? I'm currently at row 19--about to start decreasing. and I'm wondering if, when I get to the top of the body, if I can just continue on with the head?? Thanks so much for this great pattern! yes, he's an old pattern. I designed him in 2013 so I was still developing techniques as a designer. I do now have most of them all in one piece. This pattern can def be made in one piece, I can't give you the pattern for that as I'm super busy and I'd have to re-write it. The body part of this pattern starts at the bottom of the body and works up to the neck. If I were to do this pattern again, I'd start the neck at row 26 of the head and work to the bottom of the body. You'd have to figure that out but doing the body backwards. Sorry, I wish I could be more help to you but time will not allow it atm. Hi Sharon! No this is great thanks for your quick reply! I'm working my way up the body and seeing that both the head and body end with 18 stitches, I think I might be able to figure out how to work the head from the neck up! I'll give it a shot! If it works I'll let you know! If not I'll just go with the original plan to sew the head on! Thanks again! This is an older pattern (2013) and I can't remember exactly but if you were going to be using the Soft Boulce or any other specialty yarn for this project buy 2 packages and keep the receipt to return one if you don't need it. I've asked on facebook and most said one package was fine but it's always better to get 2 just in case. My hope is to go over this pattern myself as soon as time allows and get the amounts figured out. is this something that can be done in just one color or do i need 2 colors (or more)? This was the first toy I ever crocheted - I made one for my friend’s son for his first birthday (short of cash but had loads of wool). I liked him so much that I made my son one and six years later, he’s still going strong. Time to make a new (even bigger) one I think! Thanks. Your designs are brilliant!